This is stunning! I love the triple border — and I’m not generally a borders person! Botanics is one of my favorite lines. I am down to the last small pieces of it that I bought, and wishing I had bought the whole line when it was available. Fingers crossed for a reprint! Congrats on your marriage and this great finish. I’m sure it will be treasured. I agree – Botanics are lovely! I couldn’t decide which prints I wanted, which is the only reason I ended up with charm packs that spanned the entire collection, haha. 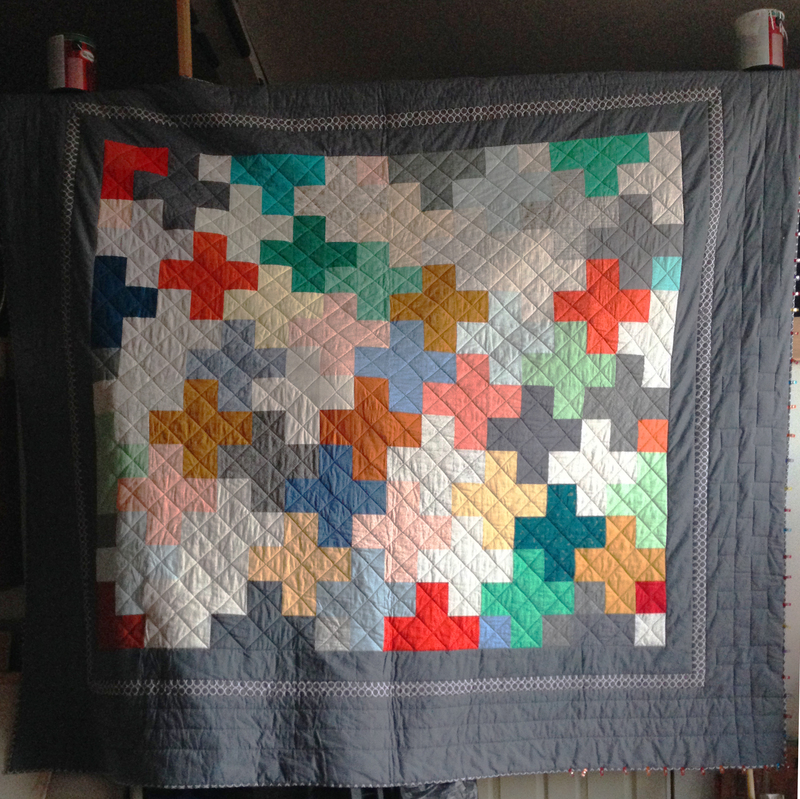 Thanks for your kind words about the quilt, too! Absolutely gorgeous. From experience I know a king size quilt that weighed half, or less than half, is a tough item to work on, especially at a machine. You are quick, and obviously strong also. What a labor of love, and well deserved from what your Dad told us about your amazing sister-in-law and her fantastically delicious meal. I didn’t realize the obstacles she hurtled over to prepare it, without even breaking a sweat it would seem. You had a Great-great Aunt Mary Lams Callewaert who learned dressmaking at a French school. When I showed her a mistake I made on an item, she told me I made TWO mistakes. The sewing boo-boo can be easily corrected. The BIG boo-boo was pointing it out to someone. I almost thought you had violated my Aunt Mary’s rule on errors, but realized that your blog is a tutorial. Well done in that endeavor also. You continue to amaze me with your creations. Thanks for the sweet comment! I am teaching my sister to sew her first quilt, and I keep telling her the same thing – DON’T POINT OUT YOUR MISTAKES! I see this blog, as you said, as more of a learning/growth tool where I explain what I might do differently or how I can improve. It’s not intended to detract from the finished product, just point out some variations. If I wasn’t strong before I started on this quilt, I definitely had some new muscles by the time I finished! Hope to have more time in South Dakota soon and to plan a visit. The last few trips have been only a weekday or two long each with a stopover in Minneapolis each way.